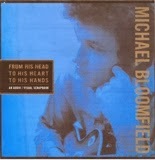 I was privileged to hear an advance of the wonderful new 3 CD/1 DVD Michael Bloomfield set, "From His Head to His Heart to His Hands," coming out Feb. 4 from Sony/Legacy Recordings. Lovingly produced by Mike's longtime friend & cohort, Al Kooper, this new set is a treasure trove of all the great Bloomfield music we remember, and a lot we've never heard before, including his "audition" for then-Columbia Records A&R head John Hammond Sr., plus many previously unreleased cuts, including a live track from the 1980 Bob Dylan concert in San Francisco. In between, there's all the great music Bloomfield gave us on his solo albums, with the Butterfield Blues Band, Electric Flag, Super Sessions & tracks with Muddy Waters, Janis Joplin, etc. The DVD gives great insight into what made Bloomfield tick, and why he was so special. I got a chance to see/hear him play live twice: in 1968 at the Fillmore East in NYC with the "Flag;" and in the late '70s at the Great Southeast Music Hall in Atlanta with one of his later bands. Back in the late '60s/early '70s there were three kings of the guitar: Hendrix, Clapton & Bloomfield. This retrospective brings that greatness home. I have no stake in this project, but as a huge fan, take it from me: this is one album you need to have.